Location: Castle Rising, Norfolk, England. Ownership / Access: English Heritage. open to public. Notes: Castle Rising is a ruined medieval fortification in the village of Castle Rising, Norfolk, England. 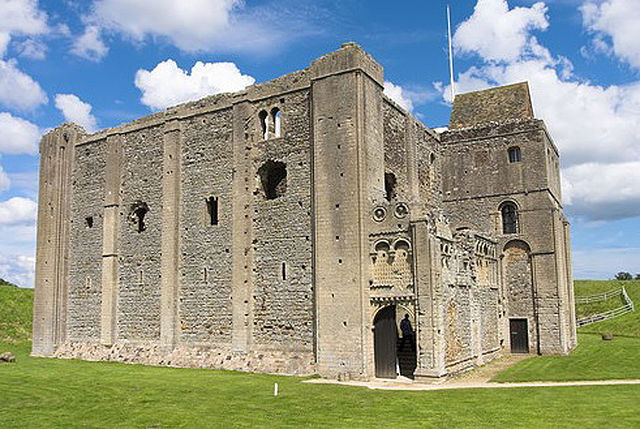 It was built soon after 1138 by William d'Aubigny II, who had risen through the ranks of the Anglo-Norman nobility to become the Earl of Arundel. With his new wealth, he constructed Castle Rising and its surrounding deer park, a combination of fortress and palatial hunting lodge. It was inherited by William's descendants before passing into the hands of the de Montalt family in 1243. The Montalts later sold the castle to Queen Isabella, who lived there after her fall from power in 1330. Isabella extended the castle buildings and enjoyed a regal lifestyle, entertaining her son, Edward III, on several occasions. After her death, it was granted to Edward, the Black Prince, to form part of the Duchy of Cornwall. During the 15th century, the castle became increasingly valued for its hunting facilities rather than its military defences. It fell into disrepair and, despite the construction of new living quarters and service facilities, by the middle of the 16th century it was derelict. Henry VIII sold the property to Thomas Howard, the Duke of Norfolk, and most of the castle buildings were demolished. It was not until the 19th century, when Mary and Fulke Greville Howard inherited the property, that the castle was renovated and restored. Victorian scholars examined the site, and it was opened to the public. In 1958 the castle passed into the custody of the state, which carried out further stabilisation work and a programme of archaeological investigation. In 1998 English Heritage passed the management of the site back to its current owner, Baron Howard of Rising, who continues to operate the castle as a tourist attraction. Castle Rising comprises three baileys, each defended by large earthworks, covering a total area of 5 hectares (12 acres), which historians Oliver Creighton and Robert Higham consider to be among the most impressive in Britain. In the inner bailey is the great keep, probably modelled on that of Norwich Castle. It features extensive Romanesque designs, including pilaster buttresses and arcading. Historians Beric Morley and David Gurney believe this to be "one of the finest of all Norman keeps", and its military utility and political symbolism have been extensively discussed by academics. The castle was originally surrounded by a carefully managed landscape, from the planned town in front of the castle, to the deer park and rabbit warrens that stretched out behind it, intended to be viewed from the lord's chamber in the great keep.